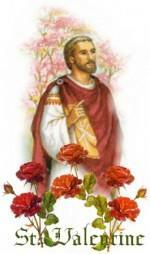 A popular account of Saint Valentine of Rome states that he was imprisoned for performing weddings for soldiers who were forbidden to marry and for ministering to Christians who were persecuted under the Roman Empire. According to legend, during his imprisonment, he healed the daughter of his jailer, Asterius, and in doing so he baptised him and 40 others as Christians. He was sentenced to death because of this. He wrote a farewell to Asterius’ daughter signing it “Your Valentine”.